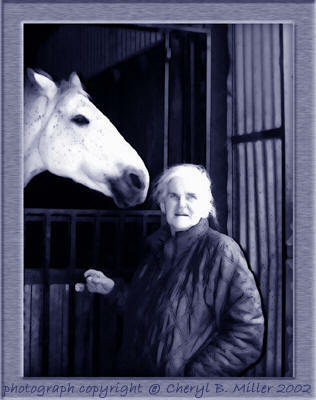 Anne McCaffrey is not only a great science fiction, fantasy, and romance author, but she is also a wonderfully prolific one, and has thus blessed the world with a variety of novels, novellas, and short stories set into her imaginative and intriguing worlds. This site is devoted to her many creations, providing basic details of all her works, and will eventually include more in-depth descriptions of worlds, species, and characters, along with details of various book editions. This site should be a resource for new readers, longtime fans, and McCaffrey book collectors. Please note that this site is currently a work in progress and will likely take many years to develop fully. Because this site is new, I'd love to hear feedback about what sections you like most and what else you'd like to find here. Newer readers may find the collection of links to excerpts of Anne McCaffrey's work of especial interest. Currently there are over 40 excerpts to be read! Fans who especially enjoy her most famous series, The Dragonriders of Pern ® should know that I already have a plethora of information about Pern that I've relegated it to its own site known as Sariel's Guide to Pern. To see the full wealth of information offered on this site, you may find it useful to visit the Site Map. I just finished reading Anne McCaffrey: A Life With Dragons, which is the new biography by Robin Roberts. It is an outstanding book: well-written, interesting, and in depth. Unlike the previous two biographies (by Todd McCaffrey and by Martha Trachtenberg, both out of print), this one is a thorough examination of Anne's life, from childhood and schooling, to marriage and divorce, to her move to Ireland and struggles to make writing a successful career, to her eventual bestseller status and enjoyment of being a "real" fairy godmother to friends and family, and her continued writing to this day. It gives a good portrait of Anne's personality and what shaped it, how her life has shaped her writing and conversely how her writing shaped her life. It doesn't shy from covering her love affairs, details which are not to be found in any previous biography (which isn't surprising: the Trachtenberg bio was aimed at pre-teen readers and her own son wrote the other biography). Altogether it gives a detailed, intimate look at Anne McCaffrey's life and the events that shaped her fiction. 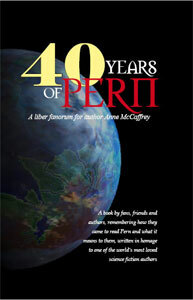 40 Years of Pern: A liber fanorum for author Anne McCaffrey is now available for order online. With an introduction by Anne McCaffrey, this book of collected essays celebrates the 40th anniversary of the publication of the first Dragonriders of Pern story, "Weyr Search". The included essays describe how fans came to first read Pern, and what it has meant in their lives. Some tales are touching, others are humorous, and almost all are accompanied by a photograph. Contributing fans include some notable names: authors Margaret Ball, Elizabeth Kerner, Naomi Novik, Jody Lynn Nye, Elizabeth Anne Scarborough, and Richard Woods; artists Les Edwards and Robin Wood; NASA Colonel Pamela Melroy; and musicians Mike Freeman and Tania Opland (creators of the MasterHarper of Pern cd). The first 10 pages can be previewed online (this includes part of the introduction by McCaffrey). McCaffrey Quest 2007 is coming in Oct/Nov! It's time to brush up on your Tower & Hive and Early Pern! This annual challenging trivia contest for fans of Anne McCaffrey is brought to you by A Meeting of Minds discussion forum. Site created by Cheryl B. Miller, copyright © 2004-2007. All rights reserved. 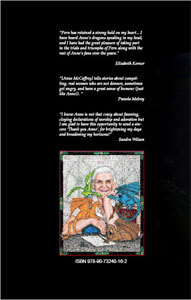 Anne McCaffrey 1967-2007, all rights reserved, and used by permission of the author.